The preferred method for double or triple labeling involves sequential staining of each primary antibody. With proper color development of substrate, the reaction product from the first substrate usually prevents most of the subsequent antibodies and detection reagent(s) from interacting with components used to stain the first antigen. This feature allows multiple labeling with primary antibodies raised in the same species using a single VECTASTAIN® ABC kit or ImmPRESS® reagent. The order of the primary antibodies and the substrates is very important. Several controls and additional blocking steps may be necessary to obtain optimal results. Numerous combinations of colors are possible using Vector Laboratories’ products and our multiple labeling protocols. The following protocols are for formalin-fixed, paraffin-embedded tissue. These protocols can be adapted for other tissue preparations. The order of labeling may significantly affect the quality and labeling pattern of each antigen in the stained section. Once the detection systems and substrates have been selected, it is best to try single labeling protocols for each of the primary antibodies with each labeling system. 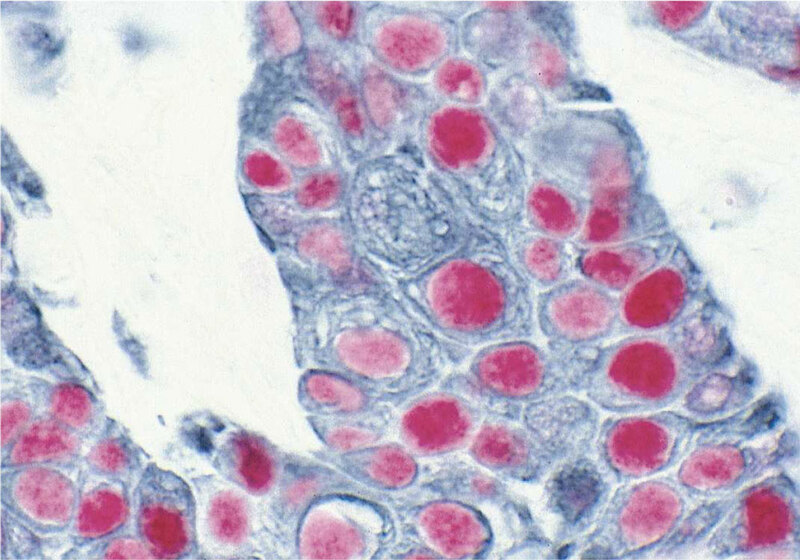 Optimize the staining conditions for each primary antibody. Include any necessary pretreatments such as high temperature antigen unmasking or proteolytic digestion and titer the antibodies to find the optimal dilutions and incubation times. All pretreatments must be appropriate for the staining of all subsequent antigens in the procedure. Once optimized, the same conditions should then be used in the double labeling protocol. Use sections stained with the optimized single label conditions as controls to compare the quality of staining and the labeling pattern for each antigen in the double label protocol. • M2A Antigen (m), ImmPRESS® Universal Reagent, DAB+Ni HRP substrate (gray/black). • Cytokeratin 8/18 (m), ImmPRESS® Universal Reagent, Vector® NovaRED™ HRP substrate (red). 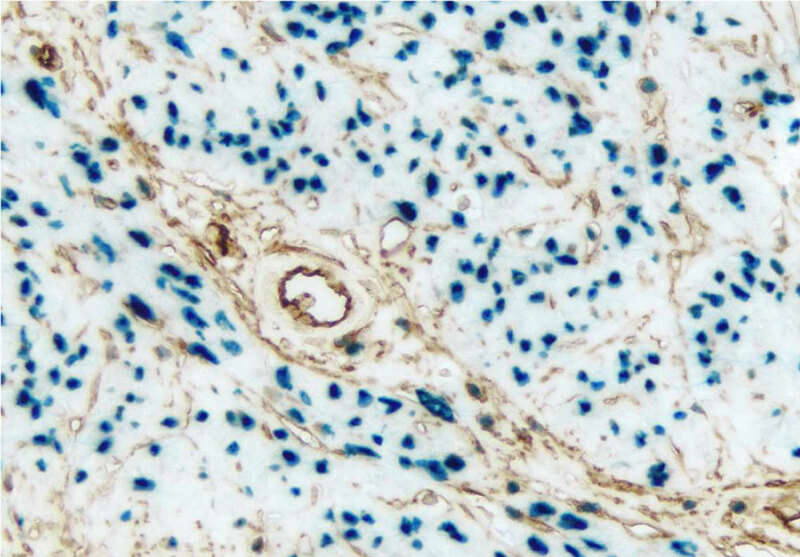 • p53 protein (m), VECTASTAIN® ABC-AP Kit, Vector® Red AP substrate (red). • Pan-Cytokeratin (s), VECTASTAIN® Elite® ABC Kit, Vector® SG HRP substrate (blue/gray). • Progesterone Receptor (rm), VECTASTAIN® Universal ABC-AP Kit, Vector® Blue AP substrate (blue). 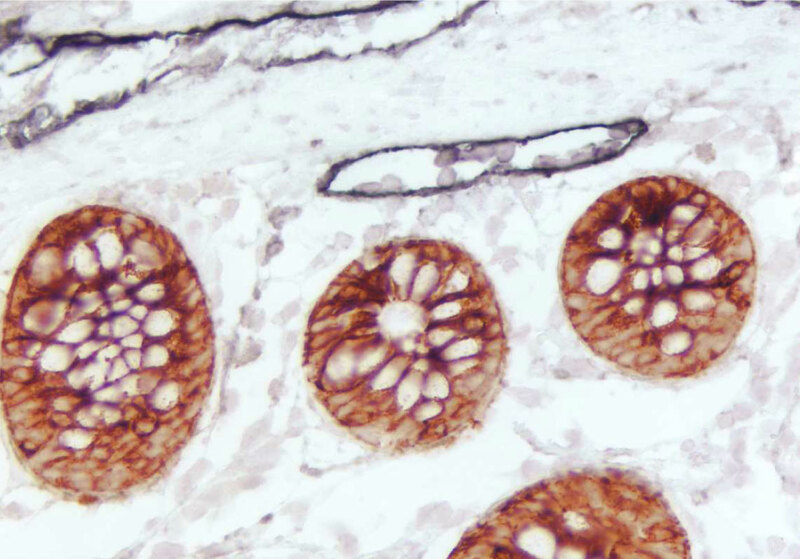 • CD34 (m), VECTASTAIN® Universal Elite® ABC Kit, DAB HRP substrate (brown). 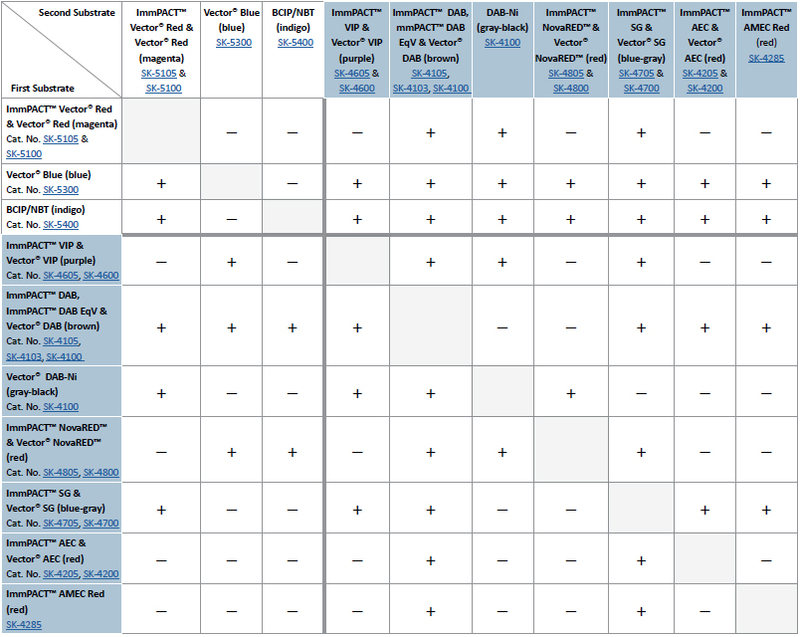 Order of Substrates in Labeling Protocol This Enzyme Substrate Combinations Table is designed as a reference for optimal multiple labeling, because the order of the two colored precipitates can significantly affect the quality, color, and labeling pattern of each antigen in the stained section. This chart ensures that distinct colors are visible after the labeling reactions are completed using an optimized multiple labeling protocol.